“Fun with Paint” - an abundantly fun and exhausting collaboration that took place last Saturday morning. It was sponsored by the Chama library and coordinated by Bruce McIntosh and Anita Massari - with me as guest artist. Over forty people showed up from the community and raged in age from 2 to over 70! It was wonderful seeing parents and grandparents paint with children and seeing the excitement in everyone’s faces as they created just for the fun of it, just to experiment, just to see what wanted to be made. The theme was, of course, “It is about the process, not the product”. 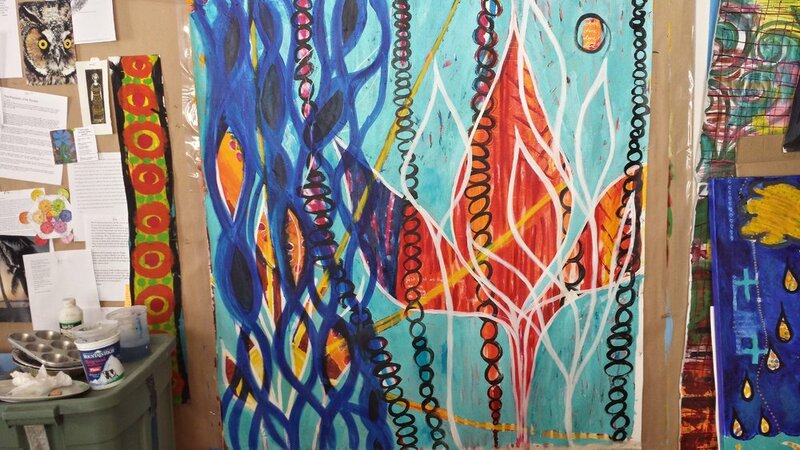 This morning’s painting session is brought to you by the double helix weaving its way through all existence, connecting, dividing, finding itself over and over. Remembering the divinity, playing hide and seek as our true nature. It is brought to you by a tightness in the solar plexus, a desire to fix and resolve what is here. A desire to know, to land, to avoid this freefall of truly surrendering as this life force that moves this body, writes these words, puts paint on the canvas. As awareness drops in to the tightness, the desire to find secure footing anywhere dissolves, unfurls its grip and what is left? Nothing, no thing, no one at all. No feet to land, no place to land, nothing to resolve. Pure energy of chaos and unknowing. And even those words are too much, too dense, to solid to describe what breathes each breath. what is left when the story dies, falls in on itself from its own heaviness. Ahhhh….. The beautiful poetry that moved through Mary Oliver is a profound gift of creativity. The heart says “yes, yes!” when I read her words, and the mind says, “ah, you don’t need me here, I can rest”. Thank you, thank you, thank you. what does it mean to create art without expectation or agenda? what does it mean to live without expectation or agenda? to move without expectation or agenda? to breathe without expectation or agenda? it is to rest and allow what comes to come, to allow what moves through you to move through without interpretation, mental contraction, judgement, analysis. it is to rest and allow what moves through to move through without connecting to the past or the future, without context or meaning. and even if judgement, interpretation, and mental contraction appear, rest in the space in which they appear. no judgement, interpretation or mental contraction about the judgement, interpretation or mental contraction in necessary. curious about where it all comes from, this space it is all moving through. noticing that it all passes away and something remains. it is to give up control that was never had in the first place. it is to rest deeper than the illusion of you as doer and see what comes. see what breathes you, what thinks your thoughts, what pulls you to one color of paint over another. what lifts the arm to create a shape, what sends an image into mind with a gentle nudge that says, "make this". it is to trust what is profoundly trustworthy and needs no interference from a small story of who you think you are. trust and see, rest as the body is breathed and moved, as thoughts come and go, as impulse and inspiration arise. rest and delight as a painting appears on the canvas before you. rest and delight as the untouchable, unmovable space in which it all happens. I recently completed the first year of the Leela School with Eli Jaxon Bear who teaches in the lineage of Papaji and Ramana Maharshi. Beautiful work that serves the awakening of all beings. I am now offering one-on-one sessions called Open Heart Sessions. An Open Heart Session is for anyone who wants support on their journey of self-discovery – who wants to bring more peace and clarity into their life, awaken to the truth of who they are, and deepen this awakening. In Open Heart sessions we join together one-on-one using the tools of inquiry, journeying, energy work and the Enneagram of Liberation to discover your deepest desires and to discover what has gotten in the way. Email me for more information. 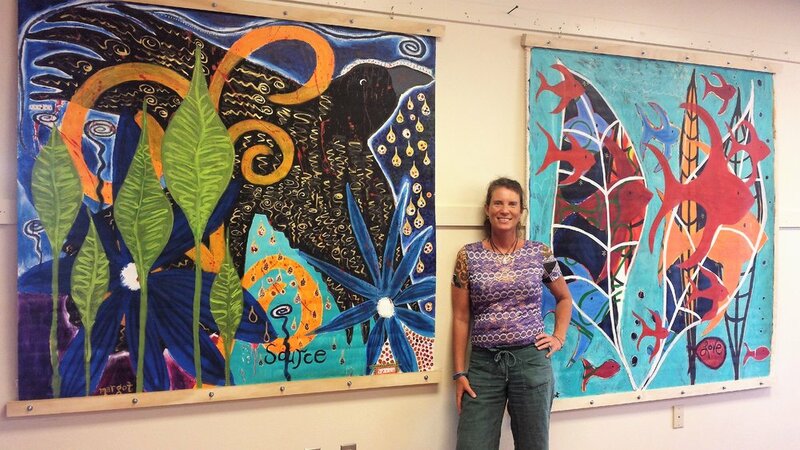 Come join me September 1st and 2nd during the Chama Valley Studio Tour. I will have paintings and prints for sale at La Luz Studio, Elk Drive, Chama. There will also be beautiful glasswork for sale by Alan Feia. Today's painting session is brought to you by the word "flow". By curves and loops and allowing the brush to effortlessly dance its way down the canvas. It is brought to you by the liquid pouring of the paint - red and gold - gushing, dripping out into the world. It is brought to you by a sense of abandon, surrender, who cares how it all turns out. It is brought to you by the great relief of not being in charge of anything, of stopping, everything. It is brought to you by the endless chasm of space that opens up when the mind stops. The silence. The peace. It is brought to you by the stillness. 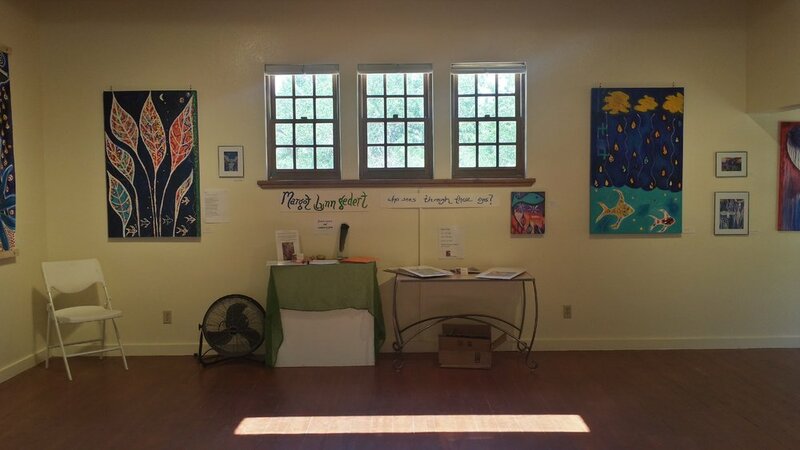 The paintings are hung along with beautiful glasswork by Alan Feia of La Luz Studio in Chama. 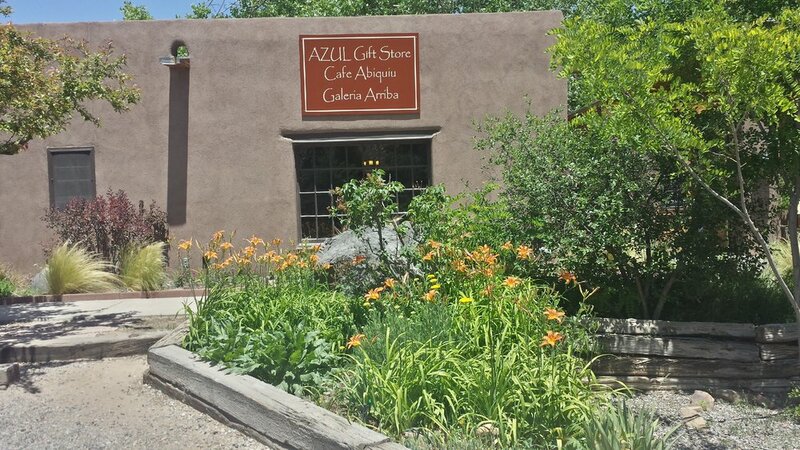 My paintings will be hanging at Galeria Arriba upstairs at the Abiquiu Inn for the entire month of June. Reception on 6/16 from 4-6.
but you keep knotting it up at the base of your spine. so you won’t have to become coins. Say ONE in your lonesome house. Loving all the rest is hiding inside a lie. You’ve gotten drunk on so many kinds of wine. It won’t make you wild. that your living is firewood. This wave of talking builds. Better we should not speak, but let it grow within. When mind is quiet, all is Self. When mind moves the world arises. Then, when mind is pure, you will see Self in all beings. Give up seeing with the outer eye and the divine eye will open. Many years ago, at a time of chronic unhappiness, I had the unfathomable luck to be led to Gangaji. While at first,my mind did not always understand the words she spoke, my heart recognized what she was offering as home. This life has not been the same since. Here is a recent interview she did in New Zealand. Always her words are fresh to me, and the Truth that she points to deepens and deepens. My gratitude is endless.